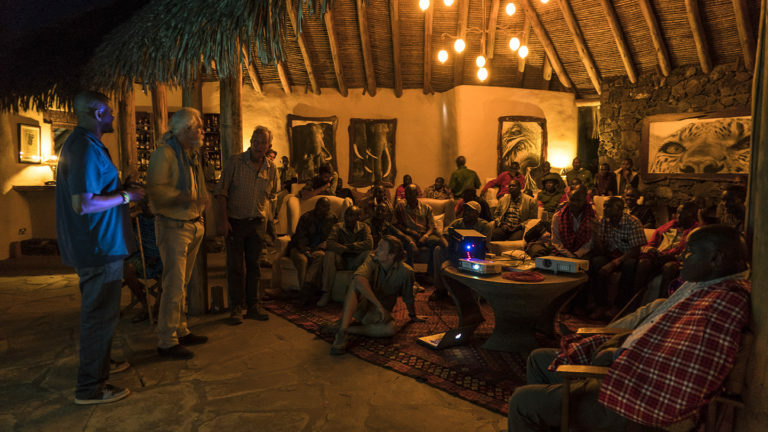 Tribe vs Pride had a special screening at ol Donyo Lodge, shown in their own language to the community who inspired the film. Dereck Joubert reports on the night and the insights that came through so strongly. We’d worked on the film Tribe vs Pride for six years. Not our most efficient turn around. Some of the warriors we had come to know were no longer warriors but now sported the shaven heads of junior elders. Babies had been born to some, and even those were running and jumping just like their fathers. In the Maasai tradition there is a ritual called Adumu, the coming out of the warrior from isolation. It involves jumping high, neck straight up to the heavens where the benign god Engai resides, guiding them to all things harmonious. We didn’t jump or look to the gods that the elders who hang out in ol Donyo Lengai do, but it did feel like a rite of passage as I stood in front of a gathering of the clans, the elders, warrior leaders, members of parliament and local council and leaders of the community after the film Tribe vs Pride had been shown in their language for the first time. It was an open air cinema, the screen tied down against the wind and I was reminded why E.O Wilson and other scientists studying insects illuminate a white screen for collecting bugs. It is not really our film. We may have made it, but as one junior elder said later: “It’s like you told my story from inside my head.” Beverly and I wanted that. It is as much as story about Maasai life and the relationship with cattle and lions, as it is about their solution: the Maasai Olympics, where young men jump and run and throw spears and compete for the glory of testing their physical fitness and this replaces the 600 year tradition of killing lions for that same glory. 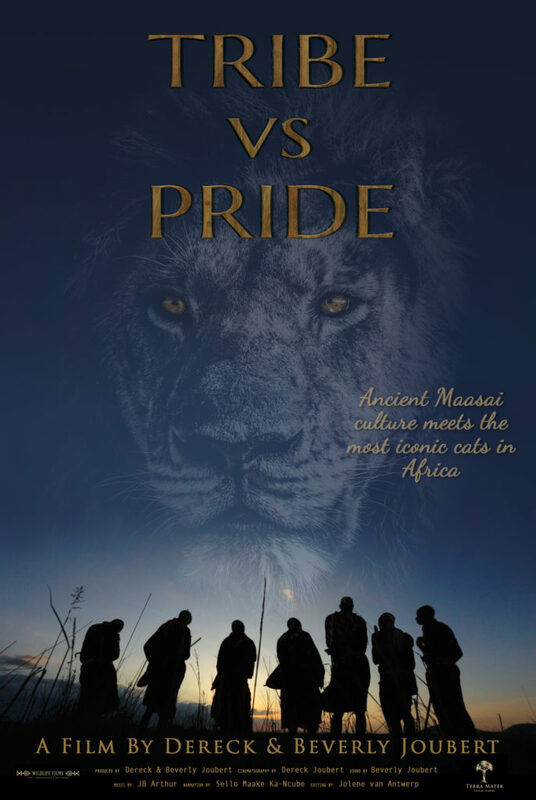 But embedded in the narrative is an honest look at the future, not about athletics, or even lions but about livestock and the very future of the Maasai themselves. The message struck a chord. It was the subject I had hoped would filter through but I didn’t expect it to be the first, and I was struck by the fact that this film means different things to different people. When we showed it in Jackson Hole, the first question was about how that society could help contribute shoes to the athletes. The Maasai cut straight to the chase. What can we do about the future? There are now 10 million cattle and many more sheep and goats in East Africa and each generation of warriors that complete Adumu and graduate, get half of their father’s land and some cattle. Smaller and smaller parcels with more and more livestock. We know how this ends. We have started looking at all the evidence of the attempts at change grazing habits in the area, with our partners at the National Geographic via the Big Cats Initiative, and why, with the Maasai, each attempt has failed over and over. The equivalent of an standing ovation is the clicking of spears and sticks and once that died down, it had all been said and while we knew, between us all, that this conversation had just begun, a deal had been struck to continue it, because the vision of a noble, lone Maasai standing on one leg like a flamingo, watching over his herd, and the distant roar of a lion are both in danger of fading away like the black and white images in our film that we had to restore, frame by frame.